Video #268: The BEERmuda Triangle - Atwater Brewing and Shelby Township. Still on the first point of the Triangle in the Greater Detroit Area, Mark, Jimmy, Joe and AJ stop in to one of the grandaddies of Detroit brewing, the Atwater Brewery. 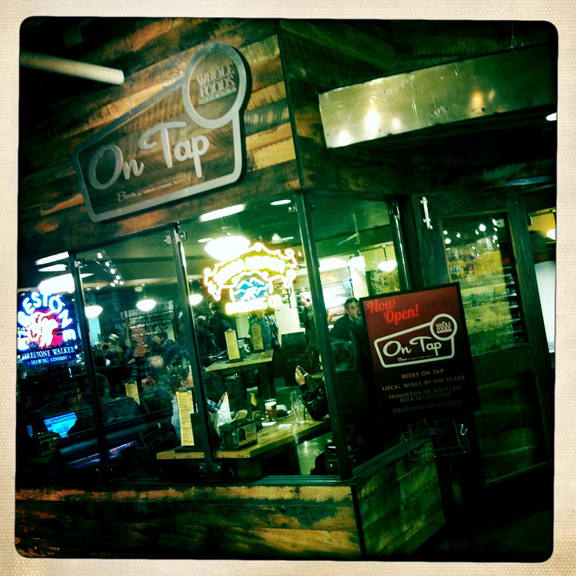 Then, a trip up the road to pair their terrific beers with burgers at the Bagger Daves Shelby location. Cheers! Collesi: Award winning craft beer from rural Italy. Howdy, Nation! Squigs here. The Happy Hour Guys were recently invited by our pal Adam Levy – "The Alcohol Professor" and founder of the New York International Beer Competition in its exciting inaugural year – to experience the fine wares from the 2012 NYIBC International Brewery of the Year. The fine beers of Collesi!Collesi comes to us from Apecchio, a small town in the foothills of the Italian Alps. Giuseppe Collesi was looking for ways to diversify the offerings of his family farm, and research led him to form Fabbrica della Birra Tenute Collesi. Working in Belgian style ale production and taking advantage of the resources at hand – the water coming out of the mountains and the grains and malts from the land his family has been cultivating since the early 1870s – Giuseppe created an absolutely wonderful line of artisinal beers. Speaking of the water, the minerality of the land seems to affect a crispness to the beers that is somewhat unique to Italian beers. Collesi's offerings are the true bounty of his home. We sampled the Chiara (wheat), Bionda (blonde), Ambrata (amber), Rosa (red), Nera (stout), and Triplo Malto (triple malt). I particularly enjoyed the Rosa which was full-bodied with a lovely sweetness, the Nero which was surprisingly light for a stout but with great flavor including a lot of cappuccino, and the Triplo Malto which is created with, yes, triple the normal malt (more sugars, more alcohol) resulting in a refreshing but complex blend of fruit and yeast and malt. The Triplo Malto might be enjoyed as one would drink champagne. Collessi is indeed looking toward distribution in the US, and this will be aided by their new state of the art brewing facility opening this autumn. So, keep an eye out for these fine artisinal craft ales with roots deep in the Italian countryside. That's what's HOPpenin', y'all! Wonderful artisinal craft ales from Apecchio, Italy. Brewmaster Giuseppe Collesi (at center). An oasis on Las Tunas Road.Howdy Nation! Artsy Guy here posting from sunny Southern California. Before there was a craft beer "scene" in the greater LA area, there was Sam and Marlene and The Stuffed Sandwich. The place is not a beer bar or a beer store but it truly is a haven for beer lovers. In order to get to the beer, you have to buy food (due to stipulations of their liquor license). They offer sandwiches of all sorts, spaghetti, ribs, and salads. On this visit, I enjoyed a delicious, super-buttery grilled cheese with deli pickle on the side. And then... Oh the beer! Sam has gathered a truly inspired bottle list from all over the world including plenty of US craft. 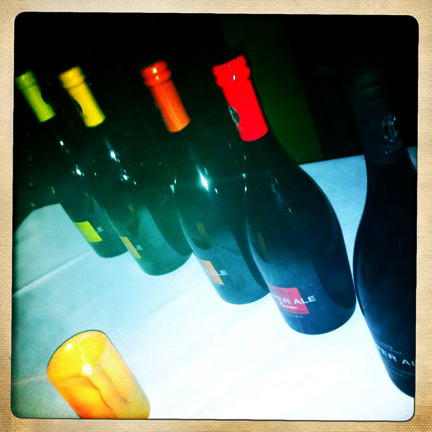 I was particularly taken with the list of various vintages of Stone anniversary, vertical epic, and collaboration brews. And there are nine taps which follow a different theme each month: a specific brewery or beer style or region. February's theme is barleywines, so my sampler included such treasures as Firestone Abacus, Rogue XS Old Crustacean, Victory Old Horizontal 2010, and North Coast Old Stock 2009. My sampler came with instructions on how best to enjoy the experience, showing a true affinity for the amazing art form of craft brewing. Sam is a legend in the LA beer community. He has earned the title "Beer Nazi" which is a term of endearment from the multitudes who are of like mind... and a warning to those who are found to be inconsiderate or otherwise unruly or – God forbid – attempt to order a Miller Light. He pours his brews with pride and deep knowledge (and his personal beer cellar is supposedly vast). Sadly, though, he has been under the weather for some time and is currently in a rehab facility as he slowly improves. The Happy Hour Guys send our best wishes to him as he recovers and to Marlene as she handily holds down the fort. Sam and Marlene and The Stuffed Sandwich. That's what's HOPpenin', y'all! Rogue Nation Headquarters.Artsy Guy here hollerin' from the Central Oregon Coast. A few weeks back, I happily wrote about the crafty brewers closest to my hometown, Ninkasi. Since I'm back in the 'hood for the holidays, I thought I'd feature another "hometown" favorite, the award-winning Rogue Brewery in Newport, Oregon. The Rogue World Headquarters sprawl out on the south side of Yaquina Bay, under the bridge. I dropped into their pub, Brewers On the Bay, for a bite. As the craft world has evolved, a few of their brews' names have evolved as well (i.e. Brutal Bitter was renamed Brutal IPA) and their ubiquitous Dead Guy Ale has undergone a few happy variations earning new names along the way. But where Rogue seems to be flourishing is in its more experimental areas. On this visit, I tasted their "John John" variations (barrel aged and otherwise) of a few old favorites. My favorite of this tasting was the John John Hazelnut Brown Nectar aged in rum cask. Yes! In the midst of the recent hop shortage scare, Rogue bought the farm. Literally... they bought a farm and raised their own hops and grains, and the result has been the lovely Chatoe Rogue line. Rogue is also well-esconced in the craft spirits movement, winning awards for their juniper gin and rums. Note: If you're a dude, you're "hops." The ladies are "malts." I don't really get it either.There's a lot going on under the jurisdiction of the Rogue Nation: brewpubs all over the west coast and distribution all over the world. And they have a motto I really dig: Dare, Risk, Dream. That's what's HOPpenin', y'all! Hello, Nation! Artsy Guy here reporting from the great Pacific Northwest... aka the corner of the country that brought you the Artsy Guy. I grew up in Oregon and get back as often as possible to my fine homestate as well as the one just to the north to see family and breathe in the air and the vibe. Georgetown Brewing!While in Seattle, I decided to seek out what was new and crafty in the city, and after seeing local brew Georgetown Brewing's Manny's Pale Ale absolutely everywhere around town (and seeing that the brewery was voted Seattle Magazine's 2011 Readers' Choice Best Local Microbrew) I headed to where the beer is born. 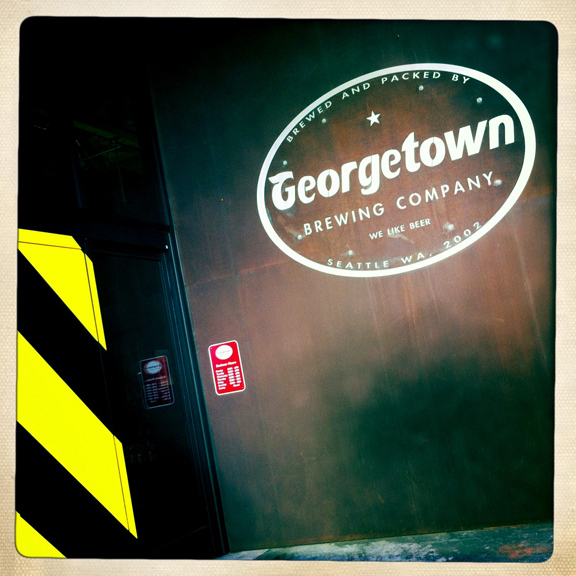 Georgetown Brewing has quite a lineup, as proudly offered to me by Harlow and team. Of course, there's Manny's Pale, the flagship brew, which is very nice. But there's so much more to Georgetown. Being the hophead I am, I was especially drawn to the fantastic Lucille's IPA and especially a couple of red ales: Chopper's Red has a sweet malt backbone but brings on the hops due to a lot of Centennial added late; and SuperChopp, brewed just part of the year, is an imperial version, getting it's great hop profile from some improvisation with locally grown hops a couple years back during the hop shortage. And there's more. I'd suggest hitting this place. They are a tap-only facility. You can find their brews all over Seattle or you can acquire kegs and growlers for incredibly reasonable prices at the brewery. Well done, Georgetown! The lineup and the Roger's Pils.After grabbing the spicy meatloaf and Marionberry salad nearby at Jules Maes Saloon (one of the oldest bars in Seattle) and pairing it with Georgetown's Lucille's IPA, I moseyed a few doors down to Full Throttle Bottles. There, I got recommendations from the staff for some great local bottles for the road. I'll post my finds and thoughts once I've had the chance to taste. Jules Maes Saloon ("since 1888") and Full Throttle Bottles.As a final thought, I think back to Georgetown's tasting room and a fellow I chatted with there. Greg had just returned from a trip to NY, and after telling me of some of the beer he had tasted there, he proclaimed that his Georgetown brews were definitely better. Of course my first thought was to represent for my own current home (NY, for those new to this blog), but then I thought twice of trying to argue. One of the beautiful things about the ever-evolving craft beer scene is that nothing can truly compare to that taste of home and the community you find there. Craft brewers are popping up everywhere. I have my favorite brews in the Pacific Northwest and in Southern California and the Midwest and New York. Each is connected to friends and family and time spent telling stories and catching up and sharing laughs. So while I'd always recommend experiencing the variety of the crafty world and seeking out what's brewed wherever you roam, take pride in and support the good stuff made by your friends and neighbors. It's good for them and the economy. And it's good for you. That's what's HOPpenin', y'all! On Tap at Whole Foods Columbus Circle.Artsy Guy here! As you can see, I've been saving up some posts. The schedule has been nuts! But I wanted to be sure to let y'all know about a few recent adventures. Most recently, I found myself at Whole Foods at Columbus Circle. The Whole Foods chain had already established itself as a great resource for craft beer lovers, filling growlers and stocking great stuff. And the beer room at Whole Foods at the Bowery is craft nirvana. But Columbus Circle stepped up the game recently by opening On Tap, where you can buy bottles, fill growlers, and sit down with a pint and some nosh. The focus of the beer is primarily local, and the food is fantastic snacky fare with emphasis on local incredients as well. This store gets crowded so, at certain times, the communal tables might be impermeable, but if you can swing by in a quieter hour the rewards will be yours. That's what's HOPpenin' y'all! Lucky Baldwin's, Pasadena.Hello, folks! Here's the third and final installment of my posts from my old stomping grounds in Southern California. As my time in Cali waned, I was able to drop into one more favorite haunt: Lucky Baldwin's in Old Town Pasadena. This is a great pub owned by an Irishman, featuring Belgian and local beers, and named for a local hero of sorts. On the afternoon I dropped in – after a chill session drinking coffee and posting my last HHG post from an honest to goodness bookstore, Pasadena's treasured Vroman's – there was a large contingent of folks cheering on Manchester United in a satellite-broadcast footy match. I ordered a half-order of their amazing fish and chips. And I sampled a local IPA and a saison from Belgium (since we were in the midst of phase two of their annual Belgian fest). Variety and adventure. So much great stuff here... and at their second space: Lucky Baldwin's Delirium Café in Sierra Madre. Great establishments! More Lucky Baldwin's. • Blue Palms Brewhouse: This is another of my favorite Southern Cal beer bars. I would have dropped in this time around, but I knew that HHG Jimmy had posted this amazing video about his visit a while back. Go! • The Stuffed Sandwich: You've seen the Soup Nazi on Seinfeld? Sam at the Stuffed Sandwich has, at times, been likened to a beer nazi of sorts. He has wonderful taste and strict respect for craft beer culture, and if you're on the same page, you will have a fantastic experience. At the Stuffed Sandwich, you must buy food, and you won't be disappointed. • Father's Office: The original Father's Office sprouted from a 50-year-old local watering hole on Montana Avenue in Santa Monica. After the current restrateurs took over, I was amongst the multitude of folks who waited on line for one of the absolute best burgers in LA. Now they sport two locations (the newer one being in Culver City), serving up wonderful craft suds, those amazing burgers, and more. • Laurel Tavern: In my old 'hood, I was happy to find a gastropub with great crafty selection. Nice craft selection and tasty grub. And I came to find out that the owners had also conceived a couple other places including The Library Bar in downtown LA. • A few other places definitely worth a mention based on a visit or two each over the years: Naja's Place on the water in Redondo Beach (a brilliant craft beer selection and almost always crazily crowded) and relative newcomer The Surly Goat in West Hollywood (another fab selection accompanied by a crazy crowd) and Golden State on Fairfax (home of the most amazing beer float ever... North Coast Old Rasputin over brown bread gelato). Well, that's a whirlwind trip of the scene here. Pick one – or several – and go! The craft beer revolution is deep-seated in Los Angeles and its environs. SO many choices and possibilities! And THAT'S what's HOPpenin' y'all! Cheers! !